Want your child to join Beavers, Cubs, Scouts or Explorers? Sign up now using one of these forms. We'll respond with details of your local groups. 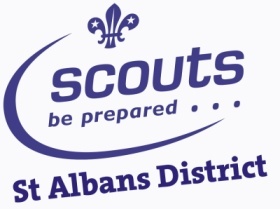 St Albans District covers St Albans, London Colney, Colney Heath, Park Street, How Wood, Frogmore, Sandridge, Redbourn, Markyate and Flamstead. We cannot accept applications from anyone living outside this area except in very exceptional circumstances.